700 reviews in the bag! Never really thought I’d ever taste this much whisky, or start my own blog, or anyone would actually take my opinions seriously. And some of those things have happened, which is pretty cool. More whisky to be tasted shortly, but I did realise recently that I had a few samples lying about and not many interesting reviews in the pipeline. 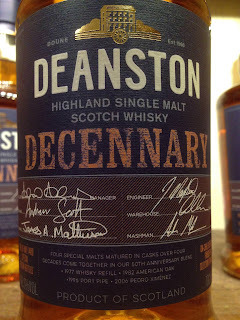 So this one is courtesy of a trip to Scotland and a very quick tour of Deanston. A pretty traditional distillery that always seems to taste quite woody to me. I was quite happy to not buy anything from the shop, but did spot an interesting looking bottle that turned out to be this. I love multi-vintage stuff and this is a great example. Technically, by the laws of Scotch whisky it shouldn’t be allowed but seems to be tolerated and the mix of young and old can be done very well. They had samples too, so I didn’t have to fork out for the full thing. Although if you’re a Deanston fan, you need the full thing. So, this is a Multi-vintage, four cask vatting. 1977 refill, 1982 American oak, 1996 port pipe & 2006 PX, released late 2017 to mark the 50th anniversary of the distillery. Nose: Soft, complex and woody. Restrained Sherried sweetness, raisin and sweet cherry, some cinnamon pastry, thick creamy vanilla really stands out, double cream, old worn leather, soft chocolate, coffee shop (Costa in particular). Quite a delicious nose. Strawberries and cream after a bit. Taste: Gentle arrival, builds spice and oak, then the creamy vanilla with some strawberry and blackcurrant from the port pipe, leather, chocolate and classy Balvenie-like oak and orange oil develop, the chocolate and cocoa notes build very nicely indeed. Finish: Medium length. Fruit from the Port, blackberry and a little floral note with some average oak but it is a little shorter and vaguer than I had hoped. Reminds me of the Balvenie 21 Portwood here. Ah, I see why they vatted these casks together now. Great marriage of flavours here. The port influence isn't too much, the older casks are bringing complexity but it isn’t over-oaked. Every cask has a say. Which is great to see. A great Deanston and if you're a fan, you need one. buuuuuuut it does come undone a bit in the finish unfortunately, which loses it some brownie points.